Buying a house, in present times, is an expensive proposition and yet it is a dream that everyone wants to fulfill in their lifetime. Usually people do not have enough savings to purchase a home outright but since they see the value of the home going up in the coming times they find it to be a safe investment. Many home buyers have the capacity to make a down payment of a smaller amount but they still need a big part of the amount to be funded. ICICI Home loan calculator helps calculate your monthly EMI payable towards the home loan. You can get the equated monthly installment by entering basic information in various permutations and combinations. Getting a home loan from ICICI Bank is quick and easy. ICICI offer higher eligibility and lower EMIs at attractive interest rates. The ICICI Home Loan EMI Calculator is a simple tool to calculate your Equated Monthly Installment. You can also compare offers from several banks and take a decision as to what is best option for you. The following information should be kept available before using the ICICI bank Home loan calculator – proposed loan amount and tenure, interest rate and processing fee (percentage), if any. Step 1 – this is used to select the proposed loan amount that the borrower wants from the ICICI bank. The slider is required to be moved to the correct amount required. You can see the selected output at the end of the slider instantly. In the next tab, enter the interest rate in percentage. For example, if the quote given to you by the bank is 9.45%, provide the same here. In the next tab, enter the fees that the bank is charging for the processing of the home loan. The last field is for pre-payments, in case you intend to make during the loan tenure. You can select Yes or No. In the above table you can see that as the loan repayment progressed, the EMI decreased. The EMI consists of both principal amount and the interest. The proportion of these two keeps changing every EMI. Gradually the principal repayment increases and the interest reduces. 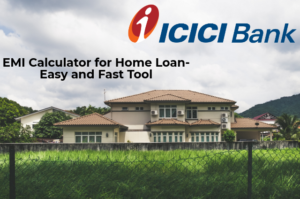 The ICICI Bank’s Home Loan Eligibility Calculator tool enables you to find out if you are eligible for a loan from ICICI Bank. Various factors like age, monthly income etc. is considered while calculating the eligibility. You can visit https://loan.icicibank.com/asset-portal/home-loan/check-eligibility to calculate your eligibility for Home Loans from ICICI Bank. The borrower is eligible to save tax by claiming deduction in IT return against the principal and interest payments. This is administered by Income Tax Laws of Government of India. The borrower can enter a few basic details of the loan to calculate the amount of tax that he can save. You can visit https://infinity.icicibank.co.in/calculator/home-loan-tax-saving-calculator.jsp to calculate the amount of tax that can be saved by you. Loan amount – The amount of money borrowed by the borrower from ICICI home loan. The higher the loan amount the higher the installment. The minimum amount of laon that ICICI offers is Rs. 15 lakh and the maximum being Rs. 10 crore. Interest rate – The rate of interest is the amount to be repaid by the borrower over and above the principal amount. A higher interest rate increases the housing loan EMI thus leading to an increase in the total cost of the loan. Currently ICICI home loan interest rate starts at 8.65%. Loan tenure – The period in months in which the borrower can repay the loan spread in EMI is referred as the loan tenure. The longer the tenure, the lower is the EMI on the home loan. The tenure is determined by the borrower’s age at the time of sanction of the loan and the retirement age. The maximum tenure of loan offered by ICICI is 30 years. Is the result in the ICICI housing loan EMI calculator displayed accurate? There may be a slight difference due to the method of actual calculation by the bank and the inclusion of other charges and fees in the loan. Who is eligible for ICICI home loan? The borrower can calculate the eligibility using the ICICI home loan eligibility calculator. In general the ICICI home loans are available for both salaried and self-employed people. There are special rates for women borrowers. What is the maximum loan value can I receive from ICICI Bank? What is the minimum and maximum loan tenure for ICICI home loan? How does part payments help the home loan in longer run? When you make part payment in the loan account with additional payments, it reduces the outstanding amount in the loan account, which in turn reduces the interest charges. This also helps in clearing the loan much faster. The interest rate in the table is slightly higher during the initial months into the loan. Why? The interest rate on ICICI house loan calculator is applied on the basis of “reducing balance principle”, the interest charges are slightly higher during the initial phase since the principal outstanding is higher. As the principal amount reduces, the interest also reduces proportionately. Tenure – The duration for which the loan amount is sanctioned is known as tenure of the loan. It may vary from 5-30 years depending on the bank you are taking the loan from and the EMI payment capacity of the borrower.